First of all, just like I've mentioned before in one of my previous post HERE, I'd like to make a note that this range smells exactly like Victoria's Secret Pure Seduction body mist (the new version, not the old version). This is the exact dupe! 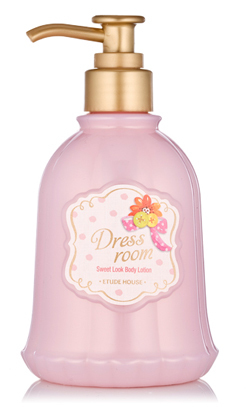 So if you like VS Pure Seduction then you would probably love Etude House Dress Room range too. Me, on the other hand, is not really a fan of the new version of Victoria's Secret Pure Seduction. I prefer the old version better, where they added cassaba melon to the mix. So this Etude House Dress Room range is not really up my alley, scent-wise. The lotion has a thick and a bit creamy formula so it glides on easily on the skin without being greasy. The lotion would also be fully absorbed by the skin in a few minutes and would leave the skin moist and smooth. Although the scent is not my preference but I still use it because I don't have any other reasons not to use it. It actually smells good, towards the sweet and girly, but it's just not my cup of tea.